It may have been inspired by the Victorian era, but you can bet that this Stand-Up Collar Shirt looks great with all manner of different time periods, ensuring that gentlemen from the renaissance and pirates of the sea can enjoy this shirt with equal ease. The shirt itself is made entirely from batiste fabric, which is a lightweight cotton-polyester blend that is comfortable to wear and easy to care for. The shirt has full-length sleeves and fitted cuffs, as well as a high-necked collar for that added flare. The shirts front is pleated for additional style, and it also comes complete with a detachable metal broach and white scarf that can be attached at the neck, in place of a more traditional cravat. The shirt is available in white, cream, or black coloration, and it comes in four sizes. 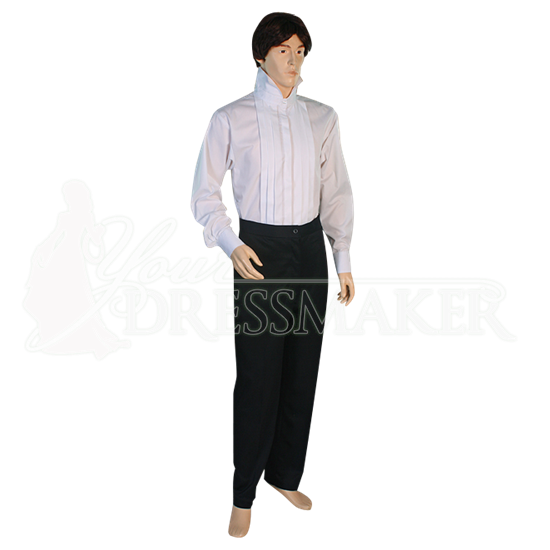 You will not need many other shirts for your costumes when you own this Stand-Up Collar Shirt, as it pairs so perfectly with other looks and is so comfortable to wear that you will find yourself using it, time and time again. The shirt exceeded my expectations. It is beautifully constructed, lovely fabric, exactly as pictured, and is a perfect fit. It's also very, very hard to find this style of shirt and it was wonderful to finally find it.